Companies want to move quicker from strategic thinking to development and roll out of ideas, offers and services. How can Agile transformation enable this perpetual state of evolution. Technology is not new as a disruptive force – but it is accelerating change like never before today. Every single service is accessed digitally, in real time by the customer. Help business & IT to be more customer centric. Break with the rigid long-term plans & improve IT project quality and efficiency: Large V-cycle programs are often risky and costly. They are risky because they take time to deliver and often meet partially their versatile objectives. Agile approaches enable teams to reduce costs by 15 to 20% with less documentation, faster collaboration, better integration and earlier detection of defects. The split of large programs into smaller synchronized projects which are more likely to succeed and stopped when needed, prevents major failures. Strengthen company’s attraction: adopting agility in its culture is an effective way to better attract digital experts (Big Data, IA, UX and UI designers, Scrum masters, Devops…). and retain employees. innovates and delivers products and services, to face its challenges in the digital market, in accordance with the company’s DNA. Capgemini Invent 4s framework for Agile industrialization. 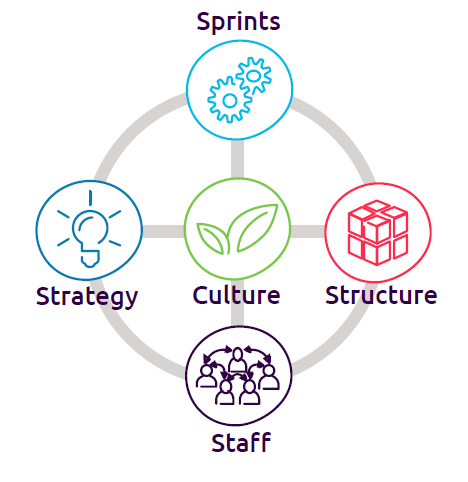 To enable this shift, Capgemini Invent has developed a 4s framework, Sprints, Strategy, Structure and Staff. Our research demonstrates the approaches to assessing the current Agile maturity of your organization, selecting and implementing the relevant levers to move at scale and and synchronizing the levers with the right tempo. Go beyond using agile methodology on projects, and bring to life industrialization of Agile, by using the 4s framework.